Earlier this year I started experimenting with a technique that I wasn't too familiar with. The technique is called "Intentional Camera Movement Photography" or ICM. 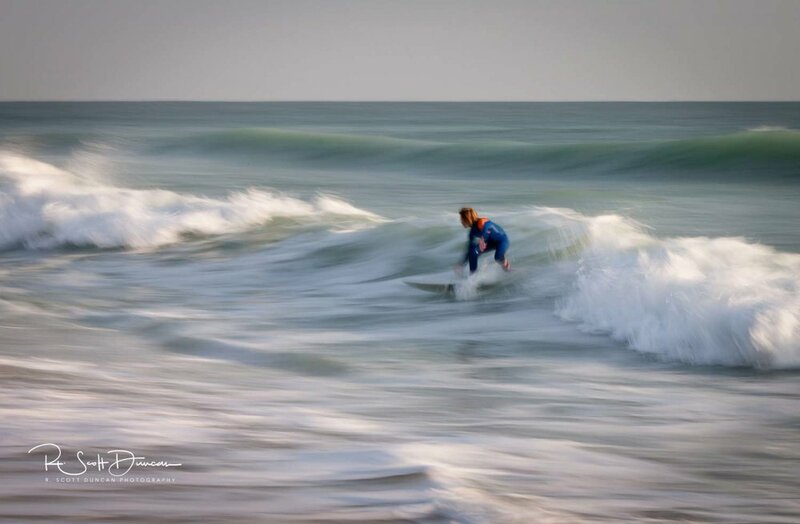 The idea is to introduce blur into the photograph using a slow shutter speed (Somewhere between 1/4 of a second up to a few seconds) while moving the camera vertically or horizontally. Intentional camera movement photography is different from long exposure and camera panning photography. Generally, long exposure photography involves the use of a tripod to avoid shake while producing a sharp, in-focus image of fixed structures. Night shots, car headlights, fishing docks, etc. Camera panning photography uses a low shutter speed while following a moving car, bicycle or surfer. Some photographers may frown on ICM as they do at HDR (High Dynamic Range) photography but I find it quite fun to do and pleasing to the eye. I've only experimented with ocean seascapes but look forward to trying it on other subjects. My philosophy is to try something new, experiment, learn, have fun, repeat. This morning I went to the beach and tried a slight variation of the intentional camera movement photography technique. Rather than moving the camera vertically or horizontally, the lens is either zoomed in or out while the shutter is open. While this is nothing new, I had yet to try it. Interesting results. Let me know your thoughts. 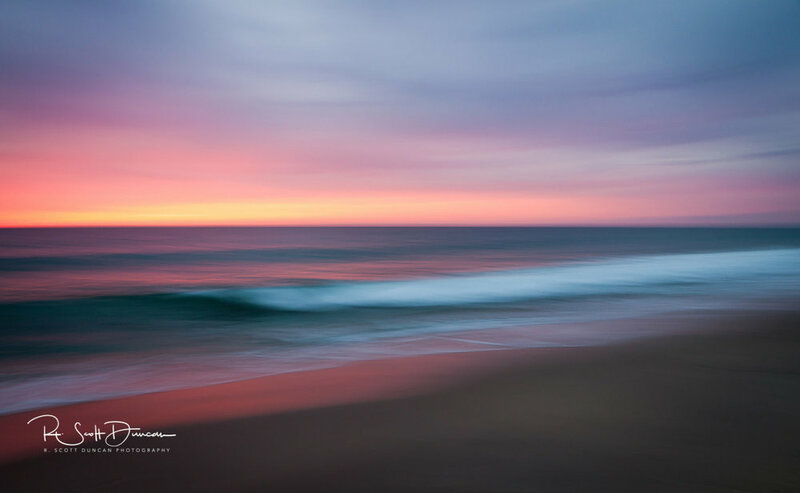 I'm pleased to announce that my seascape and ocean photography is available for purchase through my direct checkout Fine Art Photography & Ocean Art Print Store. Fine art photography for your home or office are available as prints, canvas gallery wraps and metal prints in many various sizes. If you don't find what you're looking for; ask. I'm happy to help with special requests. For larger projects , images are available through Fine Art American, Great American Art and American Business Interiors. They provide expert design solutions for your office or facility. Professional framing, matting and installation is available. 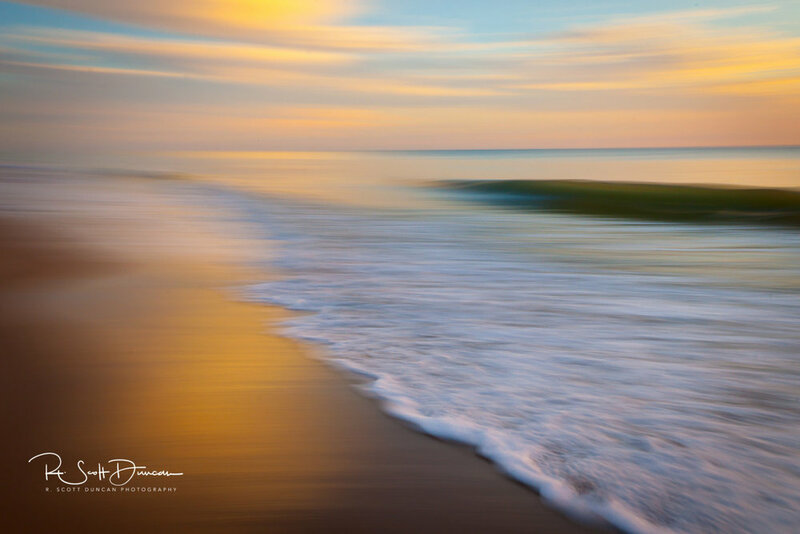 Stunning California and Florida ocean art photography by R. Scott Duncan that are competitively priced to meet your budget. A wide selection of canvas gallery wraps, framed prints, and metal prints are available for purchase.